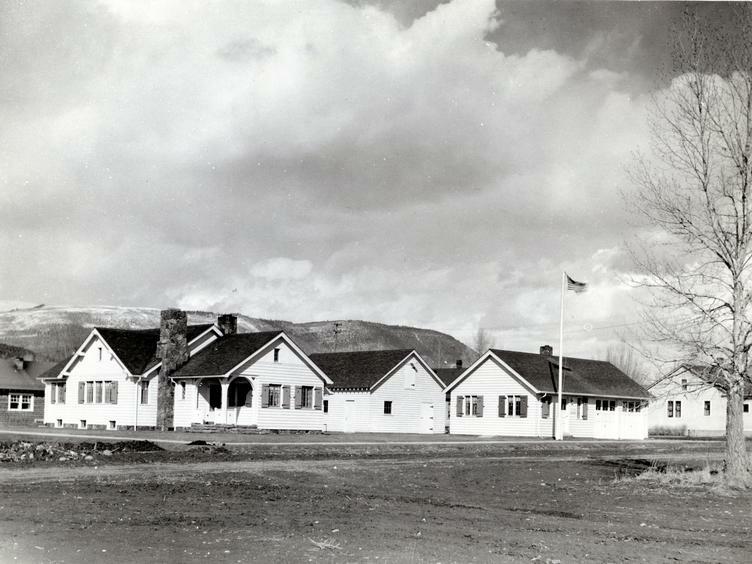 The Forest Service office and house built by Ranger Brown in 1937. The Forest Service purchased this property in 1936. The residence, office building and barn next door were completed in 1937 by the Civilian Conservation Corps (CCC) under the supervision of Ranger William Brown. The CCC labor came from the camps in Yeoman Park and Glenwood Springs. Impatient with the progress of the CCC workers, Ranger Brown is also rumored to have recruited construction workers from the “Skid Row” area of downtown Denver. The ‘Rustic” style and design of the house were used by the Forest Service throughout the Great Depression years and beyond. Ranger Brown’s success with this project prompted the Forest Service to promote him to the job of building supervisor. He went on the build Forest Service houses and offices in Glenwood Springs, Minturn and Basalt. In the 1980s additions and modifications were made connecting the office and barn and converting the barn to additional office space. These buildings have been used continuously by the Forest Service since 1937. This is the place where ranchers and loggers came to obtain grazing permits and timber operation permits. These federal government buildings serve as a physical reminder of the White River National Forest’s role in shaping a community that has transformed from an agricultural based economy to recreation based economy.